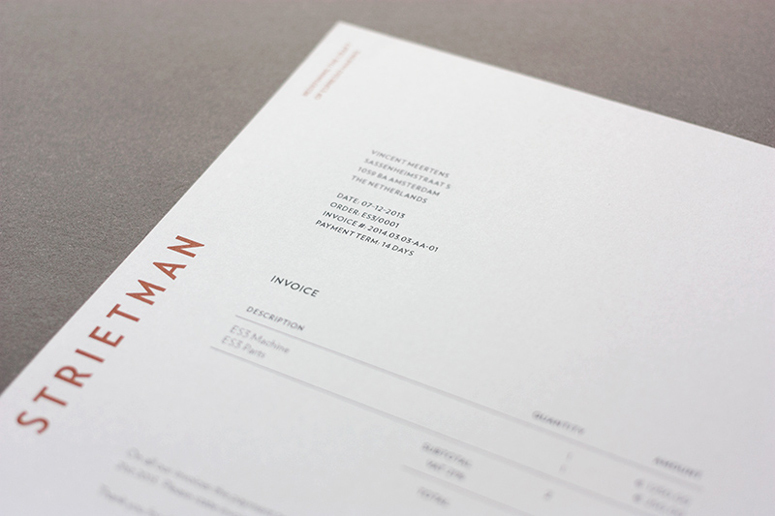 business cards: 2.165 × 3.346 in. 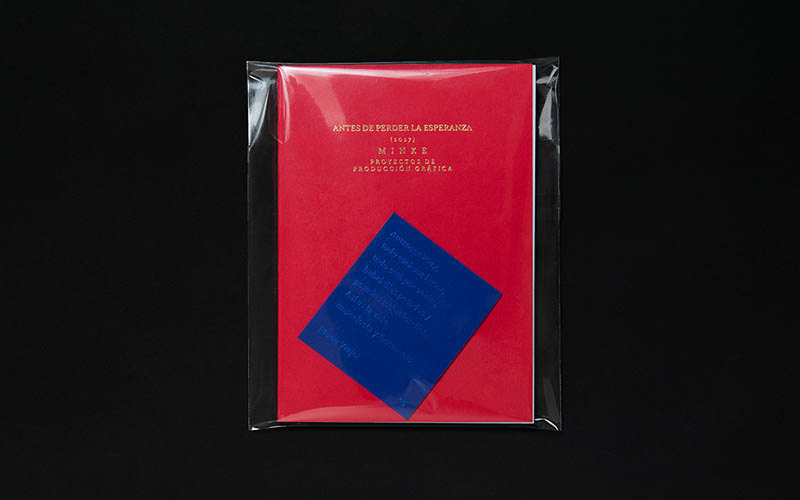 flyers: 5.8 × 8.3 in. 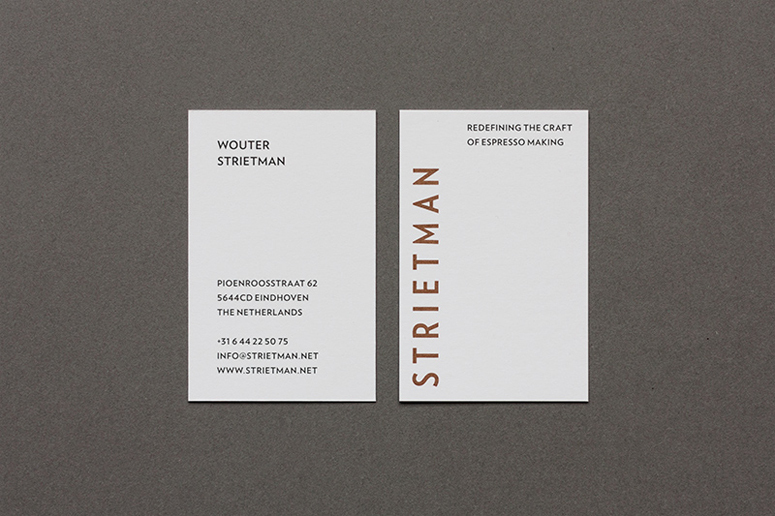 STRIETMAN, founded by Wouter Strietman, is dedicated to the perfection of espresso making. 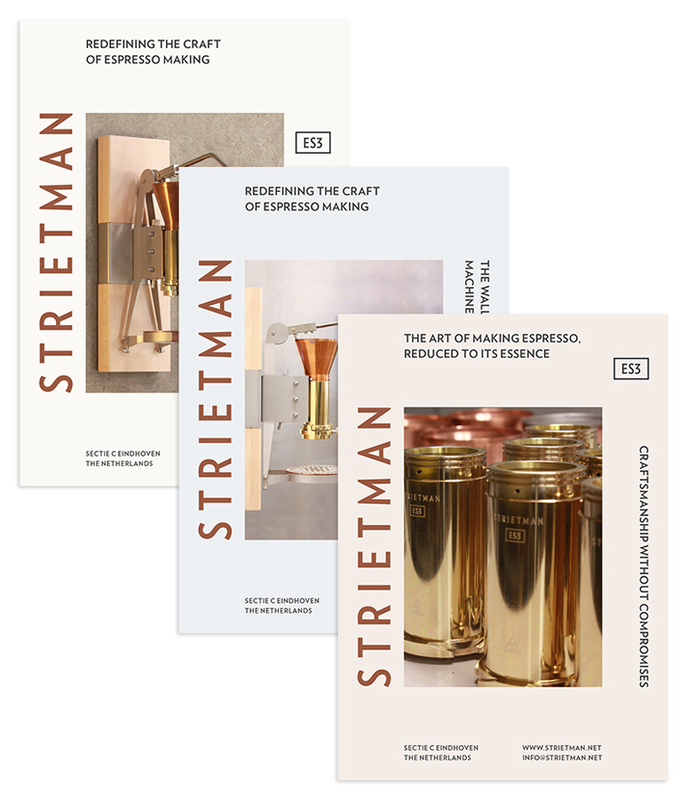 The design firm develops coffee related products for the consumer market that excel in craftsmanship: simple and reliable engineering built to last forever. 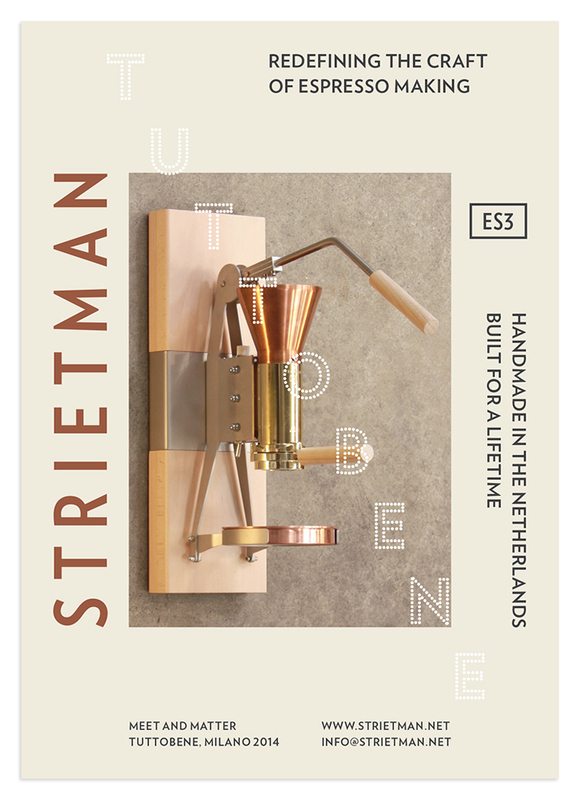 The ES3 espresso machine goes back to the essence of espresso making. 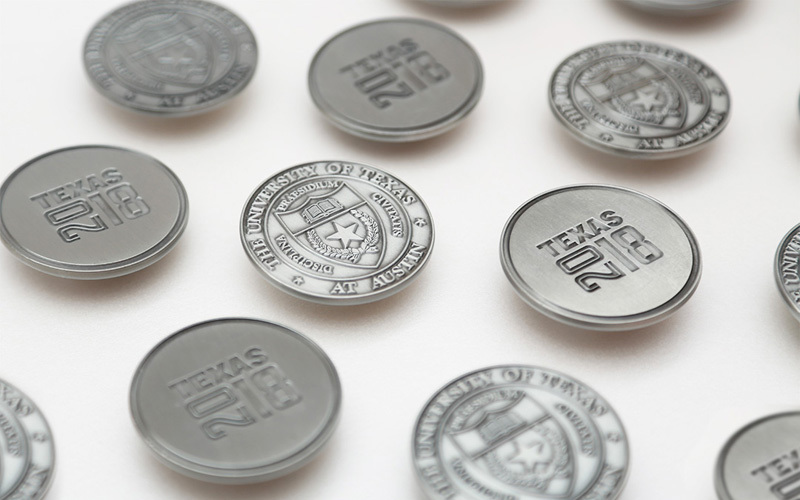 The technology involved has been simplified and made visible in every detail. 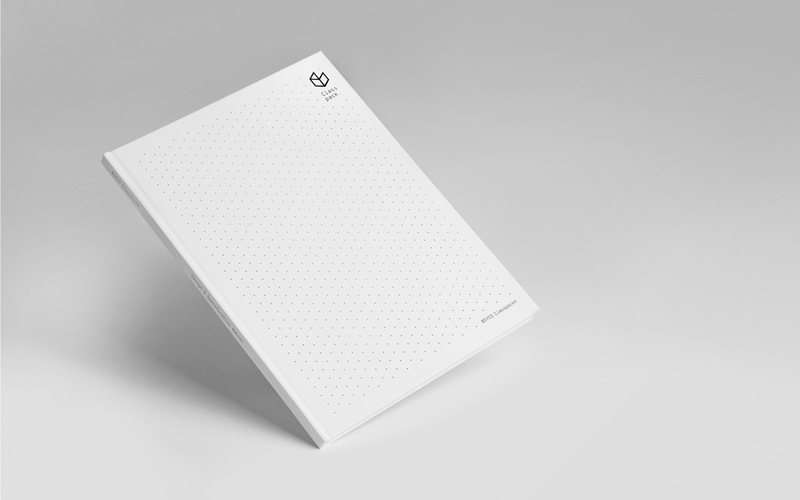 The ES3 is operated manually for full quality control, letting the user trust their own judgement by relying on the senses. 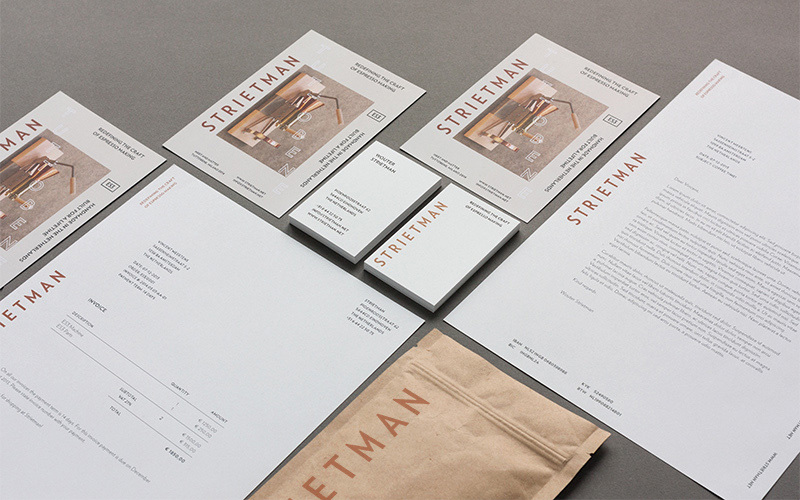 When approached by STRIETMAN to design the company's visual identity, my strategy was to communicate the exceptional attention to craftsmanship found in STRIETMAN products, evident in each and every identifiable element. 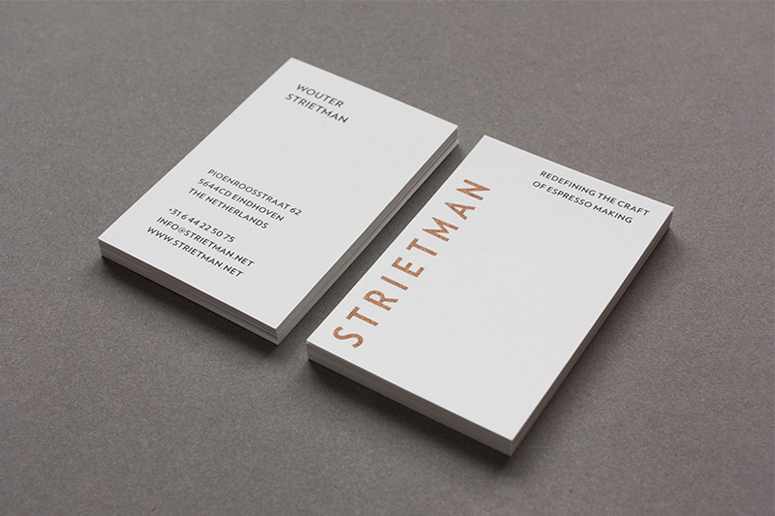 Using highly tactile paper with the logo printed in a PMS copper finish, the communication material is a first introduction to the high end quality of STRIETMAN products. 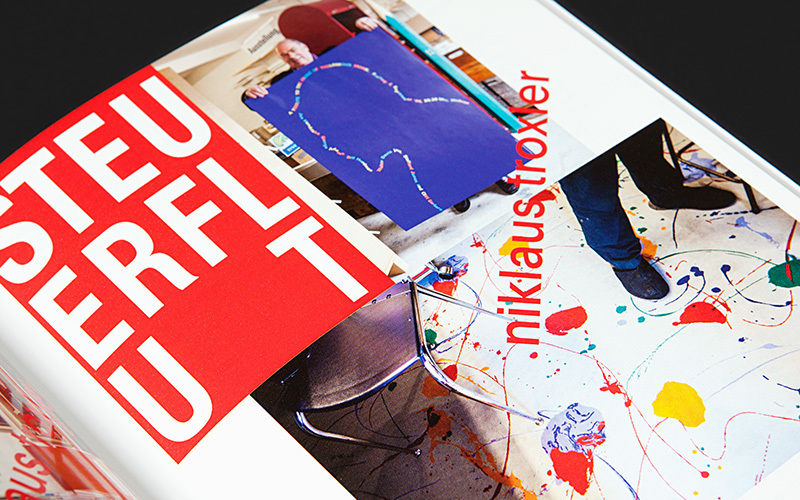 Promotional flyers are printed in sets of 3, each with their own lay-out and photography. 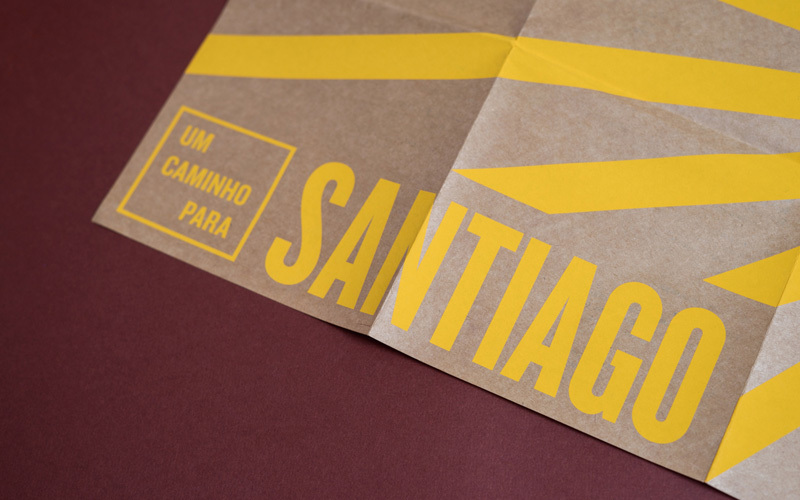 For a specific application or event, an extra layer of information is added by silkscreening on top using white ink. 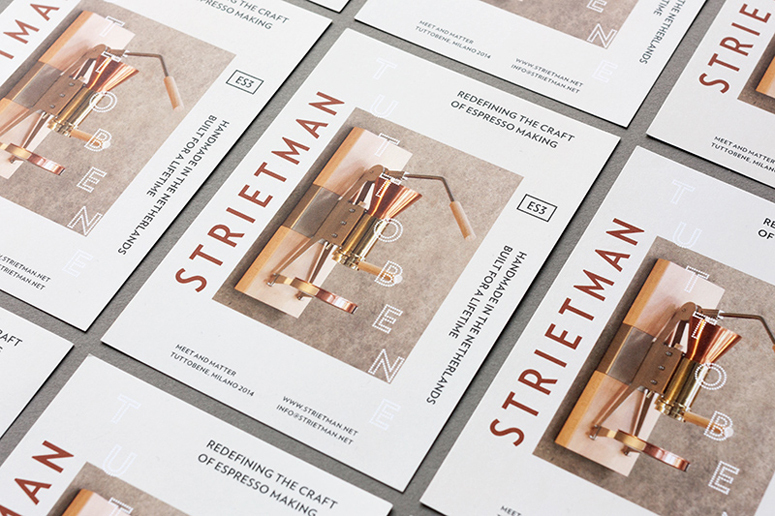 A clean typographic system supports the product photography while the color palette reflects the three main materials STRIETMAN employs: copper, brass and metal. 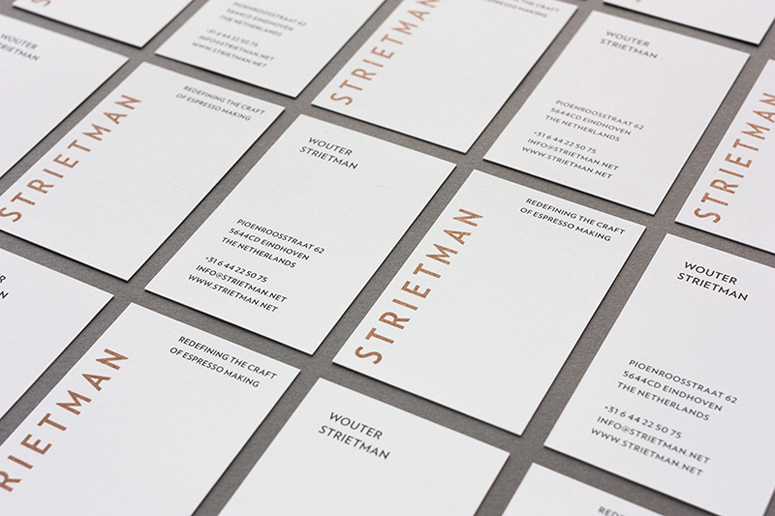 The Strietman product range uses very pure materials that are natural and uncoated (no paint or finishing layers are used). 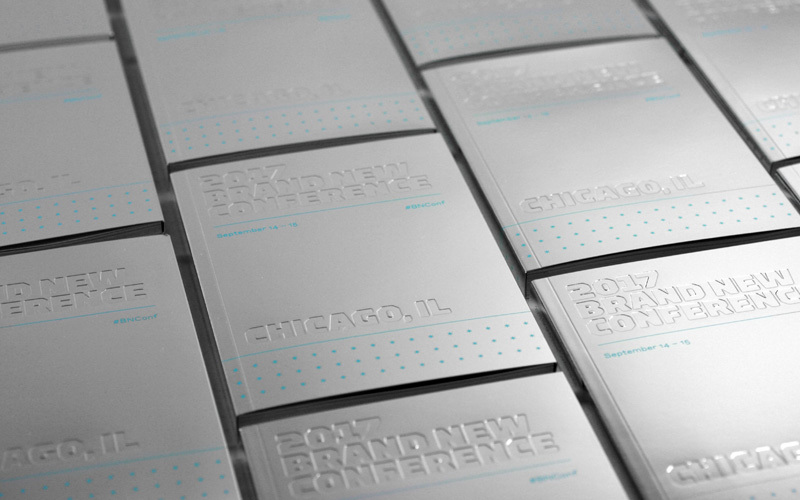 The challenge was that this same tactility and luxurious feeling needed to be present in all communication material. 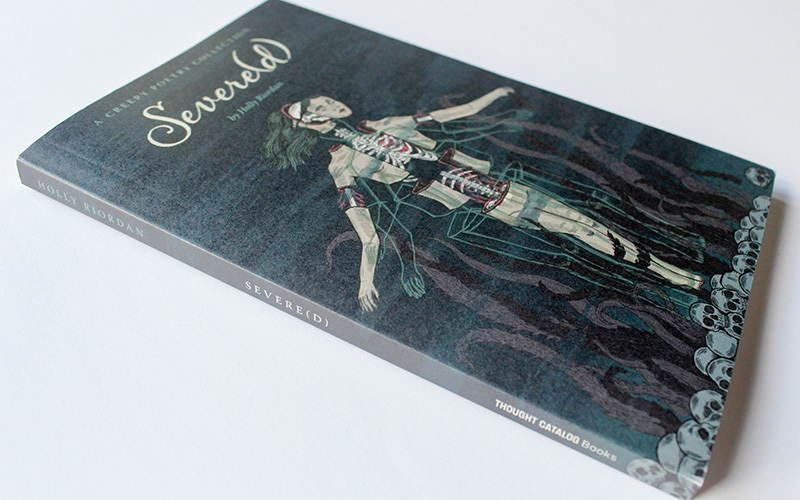 I used a PMS copper ink (876U) on extra rough paper to achieve this. 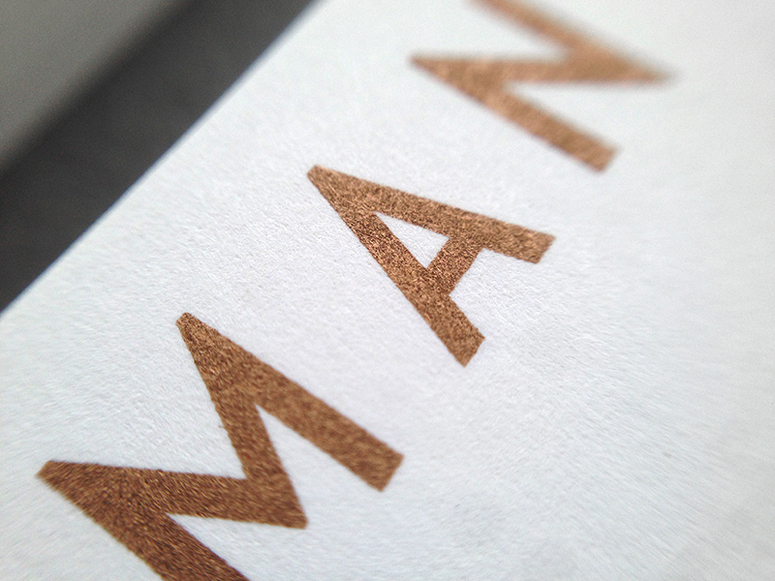 The PMS copper ink exactly has that same material qualities that can be found in Strietman products. 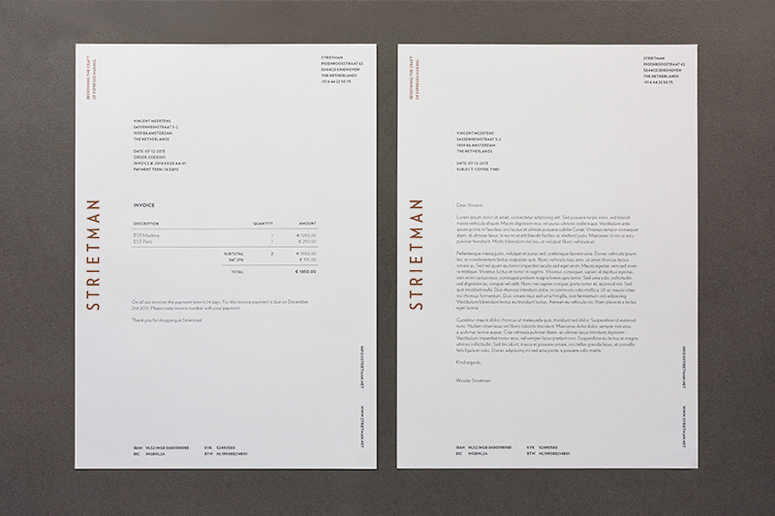 Copper ink (PMS 876U) on tactile paper replicates the natural materials used in STRIETMAN's exceptionally crafted espresso makers in this stationery suite by designer Vincent Meertens.